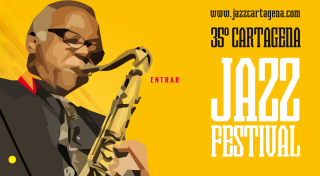 The 35 edition of Cartagena Jazz Festival will be held from Oct 31st and Nov 22nd, with a wide line up that will perform at Nuevo Teatro Circo and Auditorio El Batel. Great names as Kyle Eastwood or Andrea Motis & Joan Chamorro Group will be playing this year along with other wellknown jazz artists such as Cassandra Wilson, Joe Lovano and Ibrahim Maalouf. Learn more here.